I have made a part of my studies in Beaujolais and in particular in Belleville, I’ve always been attracted by the beauty of this region, its landscapes but also by the quality and diversity of the soils. I have ask the question to create a sort of Burgundy model by isolating each terroirs inside the same appellation, for to understand and try to find the best identity of each one. My curiosity ever more important always given my desire to include other appellation, other grape varieties. And so do it again what I had built in Nuits Saint Georges in 2001 in Moulin à Vent in 2009. The Beaujolais region represents the tip of the Massif Central, mainly composed of old granites. Granite is a hard rock, poor and well suited to the Gamay grape that is generous. It is located a hundred kilometers of Nuits-Saint-Georges. We find many similarities with the Burgundian model, both the Cru and Climates, as the modes of vinification and aging. We also find common points with the aromas and structure of Burgundy wines. 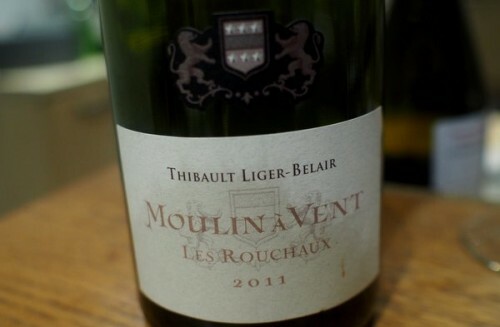 I would say that the wines of Beaujolais are cousins of Burgundy wines. To create the Domaine and buy the first vines I’ve tried to understand the different types of soil in my inquiries with the winemakers tasting the wines and especially by walking through the vineyard. What surprised me in the first place is to see as much difference in an area as small, it reminded me the Burgundian terroirs. However I haven’t seen too much producers make a difference between each parcel, if they have vines in Moulin à vent they will produce a unique cuvee of Moulin à vent without isolating the different types of soils. Hard to understand when you have a Burgundian approach which isolates each parcel. – Plowing and removing all herbicide. – Convert all parcels from the first year in organic and biodynamic farming. The work we are trying to do in the vineyards is for to awaken the soil and its terroir, ask to the roots to go deeper and search to nourish the grapes by revealing the identity of each soil in the bottle . Concerning the vinification, I try to do the same work that I do in Nuits-Saint-Georges without carbonic maceration because, I consider that this type of vinification give some standard wines. It’s why all is destemmed with some very long maceration, nearly one month, with some pumping over nearly every day and 1 or 2 pushing down only for to move the hat. The aging is made in barrel, for the” Rouchaux” and “Vieilles Vignes” in 2 or 3 years barrel without new oak and 20% new oak for the cuvee “La Roche”. We keep the wine for a period between 12 to 15 month before bottling.